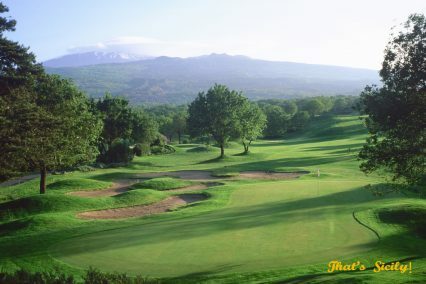 Sicily has a a total of 126 holes available for play at five different golf facilities. These range from the homely little 9-hole course at Villa Airoldi in Palermo to the magnificent new 45-hole at the 5 star Verdura resort near Sciacca. 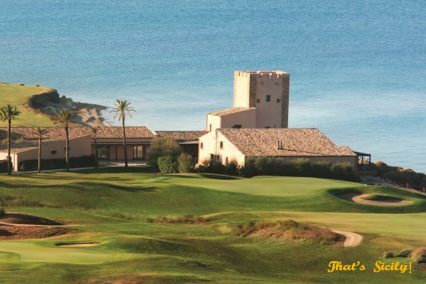 In between these golfing extremes, you’ll find a couple of Luigi Rota Caremoli-designed layouts at Picciolo and Le Madonie as well as two contrasting 18- hole courses at Donnafugata, near Vittoria. 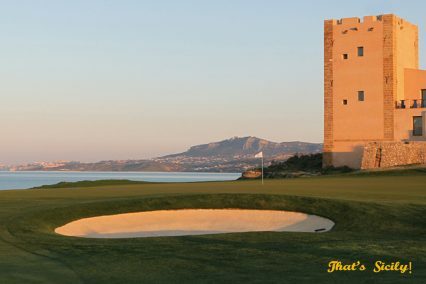 The absolute top tracks on the island are those at the luxury Verdura Resort, where half the fairways from the East and the West courses created a composite championship layout when the Sicilian Open was held here in 2012. 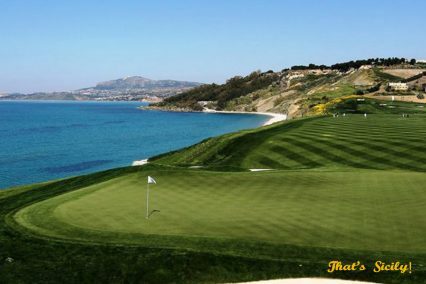 The two Verdura golf courses are by far the best in Sicily and no expense was spared during the construction of the 5-star Verdura resort on the south west coast of Sicily. 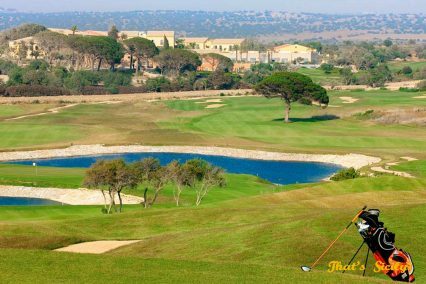 The resort covers an area of 230 hectares, 120 acres dedicated to golf and enjoys nearly 2 km of seafront property and the 45-hole, 6547 m golf complex at its centre is one of the best sporting facilities to be found anywhere in the Mediterranean region. 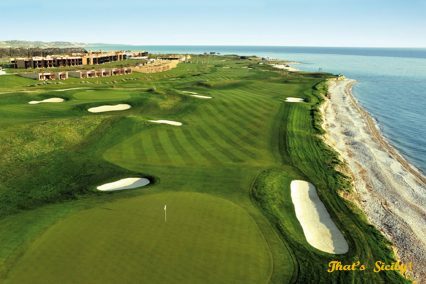 Designed by the esteemed American architect Kyle Phillips, the two championship 18-hole layouts – and West – are the golfing stars of the show at Verdura and they are well supported by a 9-hole par three course, a driving range and practice area. The West is arranged as a traditional out-and-back course whilst the East is laid out in two returning loops of nine holes. 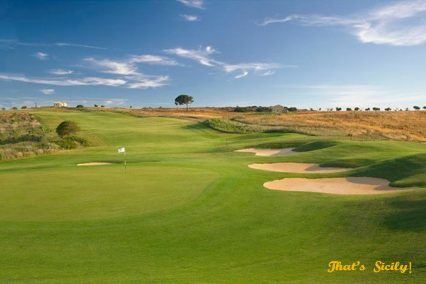 Significantly, the routing of both courses is such that, when professional tournament play is held at Verdura, a fantastic composite course can easily be set up to include the best holes on each layout. Verdura hosts an excellent spa and fitness complex, pools, kids and teen clubs, 5 bars and 4 restaurants. The luxury five-star Donnafugata Resort in the south west of Sicily, has two two 18-hole course; the Links layout is a Franco Piras design that sits on an open, rolling terrain with views of the Mediterranean Sea that stretch out around a couple of lakes between two large valleys, whilst the Gary Player-designed Parkland course winds through a typical Ragusan landscape of olive and carob trees. 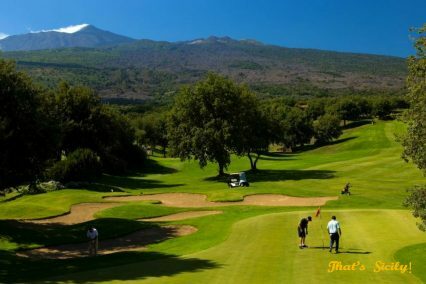 Nestled between the Etna Park, the Nebrodi Park and the Alcantara River Park, with breathtaking views of Mount Etna, the Picciolo has an 18-hole layout and is measuring 5,881 metres from the championship tees, the course plays to a par of 72. 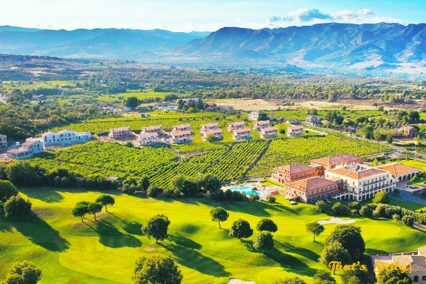 The exclusive 4 star Picciolo Golf Resort offers also a SPA, restaurant, guest quarters, outdoor and indoor swimming pools. This international standard 18 holes golf course, 6004 meters and par 72, was designed by Luigi Rota Caremoli and consists of 5 artificial lakes, a wonderful collection of bunkers, the unusual rough characteristics of more than 3000 olive trees, a mix of 2000 orange and lemon trees, more than 2,000 almond trees, 3,000 flower and berry evergreens and about 100 carob trees and countless aromatic plants such as lavender, myrtle, thyme, laurel, jasmine and verbena were planted, making this quite a challenging, however beautiful experience for every player. 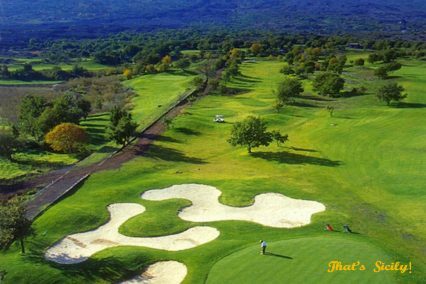 It is equipped with a putting green, a pitching green, a chipping green and a driving range with 26 teeing places. It overlooks the Tyrrhenean sea on one side and the national reserve of the Madonie Hills on the other. With 9 holes, par 35 with driving range, putting green, pitching green, chipping green, and bunkers test, has been created inside Favorita Park, the largest green area of Palermo (140,000 square meters) build in the eighteenth century, surrounded by a impressive mountain range fountains and lush trees. In addition to the golf swimming pool and clubhouse, Villa Airoldi also host a selection of extra activities such as: brunch, cocktails at sunset, concerts, dances, theatrical events and exhibitions. 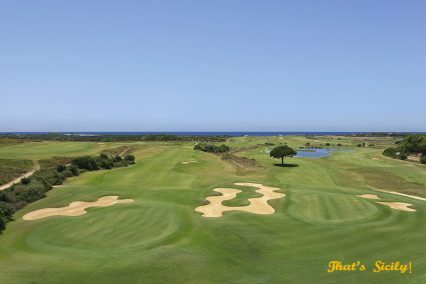 Below are photos from the main 5 golf courses in Sicily.